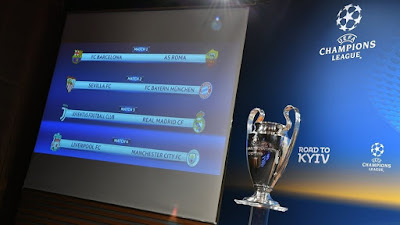 After the conclusion of the 2017/2018 UEFA Champions league round of 16 over a two legged tie the following eight football clubs are the survivors. The draw for the 2017/2018 quarter-final season has been made and the draw had the last two premier league clubs left in the UEFA Champions League facing each other, Liverpool Fc and Manchester City. There will be a repeat of 2016/2017 UEFA Champions League Final as Real Madrid will face the old lady of Turin, Juventus. Sevilla, after seeing off Manchester United will have to face 2013 champions, Bayern Munich. AS Roma will face a very uphill task as they battle FC Barcelona in the quarter-final. The first legs will be played on April 3 and 4, with the second legs on April 10 and 11. When will the quarter-final matches be played? What about Arsenal and the Europa League draw?